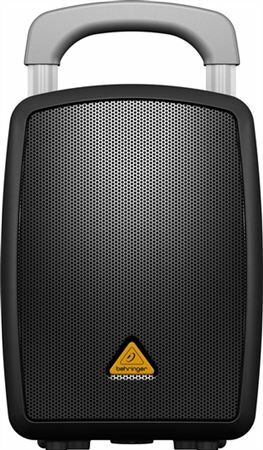 Shop Behringer EUROPORT MPA40BT-PRO PA System from AMS with 0% Interest Payment Plans and Free Shipping. Users can stream songs from their Bluetooth-enabled iOS device at their next big event to get their message out to people across the playing field or parking lot with this extremely lightweight and powerful 40-Watt amplifier known as the Behringer EUROPORT MPA40BT-PRO. This premium 2-way speaker system provides excellent sound, and the rechargeable battery can last up to 12 hours for all night events. This system can go anywhere with its wireless capabilities, and with the ability to add one or two Behringer ULM digital microphones it’s almost too easy. The days of tape decks, CD players and even MP3 devices are ancient history. Now your music lives on your phone or computer tablet, so you can stop searching for those obsolete cables and elaborate adapters. Now with just a thought, you can stream music from any Bluetooth audio-equipped device such as your iPad, iPod touch, iPhone and even your laptop computer. How easy is that? Both models feature built-in 2-channel mixers with the same ultra-low noise,high-headroom mic preamps that have made BEHRINGER mixers legendary.Also included is 2-band equalizer,plus Bluetooth for streaming audio directly from your iOS device, and our proprietary ULM wireless technology.Sold separately, BEHRINGER ULM Series digital mics integrate seamlessly to expand your MPA40BT PRO system to handle virtually any live sound application. I’ve used for couple years in nursing homes for playing & singing. Very room filling smooth music. Great with the Behringer wireless mics. great monitor when djing events where they do not have one. Love the easy transport. Great for impromptu parties/music listening sessions. great gear for the money! works great for my purpose of having a small pa for announcements, and wedding chapel gigs when a larger setup is too much! the only thing i could ask for is a line out to use multiple units! Really light and louder than I expected. Does a great job the little bit I have used it. gets quite loud for only 40 watts. Good bass response from the 8" speaker. EQ seems to work well too. lots of input options and battery life seems very good so far. great unit!! !